Avril Lavigne is a Canadian singer-songwriter whose high energy, punk rock music gained popularity in the United States after the release of her debut album, Let Go. With three hit singles on her Let Go album (“It’s Complicated,” “I’m With You,” and “Sk8er Boi”), Lavigne became the second artist in history to have three top-ten songs from a debut album on Billboard’s Mainstream Top 40 Chart. Avril jumps right into sight to begin telling the story of “Sk8er Boi,” wearing black high top chucks. Avril shows off her punk rock style, complete with striped knee socks, studded wristbands, and black chucks. During the instrumental introduction of the song and the beginning of the video, Avril’s band is promoting the concert via posters, flyers, graffiti, etc. 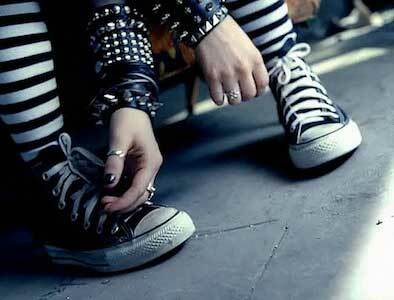 Avril then jumps into a velvet chair—wearing chucks—and begins to tell the “Sk8er Boi” story. Avril sings, her friends and band mates play the drums and guitar, skateboard, and wreak other sorts of havoc, as punk rockers typically do. Her studded leather wristbands and tomboy apparel make it clear that she is more of a “skater boy” than a girly girl. Lavigne and her band arrive at the Los Angeles street intersection and perform the concert on the roof of a car. 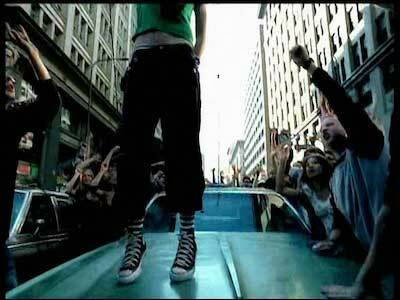 A rowdy crowd surrounds Avril as she rocks out in black chucks on the hood of the car. The crowd of rowdy fans surrounding them grows quickly and the concert turns into a mini punk rock riot. Towards the end of the video, a helicopter hovers over the concert and attempts to settle and disperse the crowd. 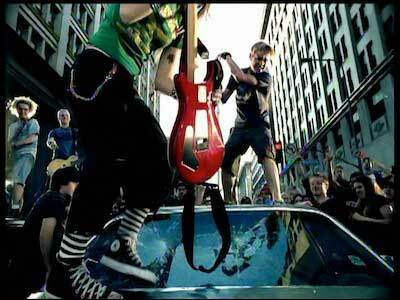 As the impromptu concert comes to an end, Avril uses her red electric guitar to smash the car’s rear windshield. Wearing black high top chucks, Avril uses her guitar to smash the back windshield of the car as her impromptu performance comes to a close.